Ballarat Insurance Brokers acknowledge that the Information Technology sector is one of the fastest growing markets where our current and potential clients require seamless insurance solutions for an industry that can be extremely sophisticated. At times, it can be difficult to distinguish between what is ‘design and/or advice’ and what is the ‘product’. By insuring both your Professional Indemnity and Broadform Liability Insurance under the one policy, Ballarat Insurance Brokers ensure you and your business are comprehensively insured should a loss or accusation of negligence be made. With a long list of Insurers; Ballarat Insurance Brokers can ensure packages are tailored to include all areas of potential liability and ensure you and your IT and/or Communication business covered and limit any impact to the business’. 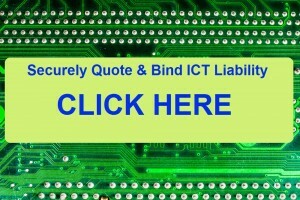 By click on the below picture you’re now able to quote, arrange cover and pay for your ICT Liability Insurance entirely online; 7 days a week 24 hrs a day. Contact Ballarat Insurance Brokers today to obtain a no obligation quote and review of your IT Insurance needs.